4 ICT teachers of the Endratevy high school started to conduct training of OpenOffice in Khmer language to 44 none-ICT teachers. 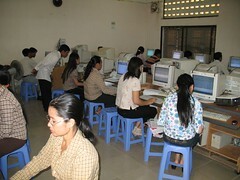 On the first week of September 2008, there are many none-ICT teachers registered for this course. The course organized by the Endratevy high school with the support of the Open Institute to only the ICT teachers that have to teach those none-ICT teachers and also the training materials provided by the Open Institute. At the opening on the first day, the director of Endratevy high school addressed to his teachers that they should come to study Khmer software altogether to be able to use for their work because all in this software has our own language (Khmer) and free.